Sure, it has plenty of cardiovascular benefits. It’s also a “natural” movement, and since most people do it at some point in their lives, many people think that running is the best way to get in shape. No special skills to learn! But running advocates sometimes gloss over the stress it places on the knees, hips, and lower back. We’re talking anywhere from six to eight times your weight in ground reaction forces with every stride. Below is a quick and easy routine that will not only help you burn calories and provide a cardiovascular training effect, but will also help you build muscle. That extra muscle will help bulletproof your body so that it 1) doesn’t break down as easily, 2) burns more calories while at rest, since muscle is metabolically active tissue, and 3) survives the apocalypse. Perform the following routine two or three times per week (or in place of one of your middle-distance runs) in circuit fashion, with as little rest as possible between each exercise. Your goal is to do three to five total rounds, with 60-90 seconds of rest between each. Hold a dumbbell at chest height with both hands. Chest tall, feet a little past shoulder width apart with toes slightly pointed outward. 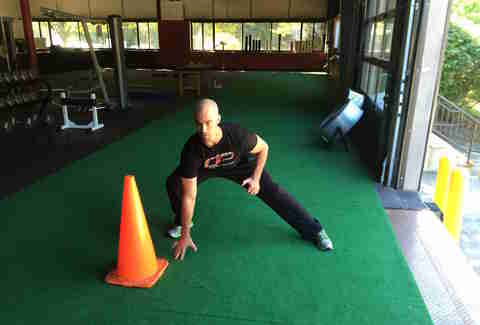 Sit back with your hips and push your knees out as you lower yourself toward the ground. Maintain an upright torso throughout, and don’t allow your upper back to round. 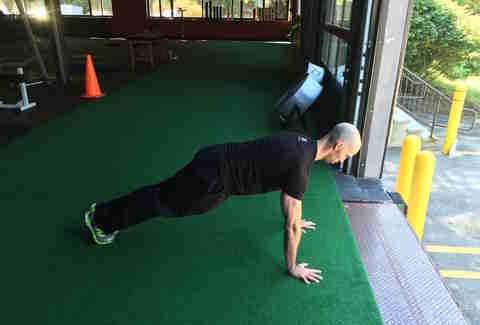 Assume a push-up position with feet together and hands just wider than your shoulders. Spread your fingers and think about ripping the floor apart in between your hands. Be sure to squeeze your glutes hard, and brace your abdominals. Lower yourself without allowing your lower back to arch too much, and make sure you keep your head behind your chest. If you need to make these easier, elevate yourself on a bench or chair. If you need to make them more challenging, perform with a band across your back. 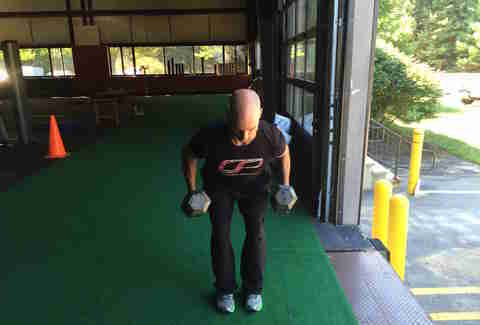 Start with the dumbbell in the same position as the Goblet Squat. Step back with your right leg, keeping your torso upright, until your right knee gently touches the floor, then return back to the starting position. Bending over at the hips so your torso is at a 45-degree angle with your knees slightly bent, chest up, and your arms fully stretched with a dumbbell in each hand, pull your elbow toward your hip. Pause for a count or two, and squeeze your shoulder blades together. Return back to the starting position making sure to feel a “stretch” in the bottom position. Don’t allow your upper back to round. Facing one direction, simply “side shuffle” 15 yards to your right, making sure to keep your chest up and knees slightly bent. Tap the ground with your right hand and shuffle back in the other direction to your left. Tap the ground with your left hand. 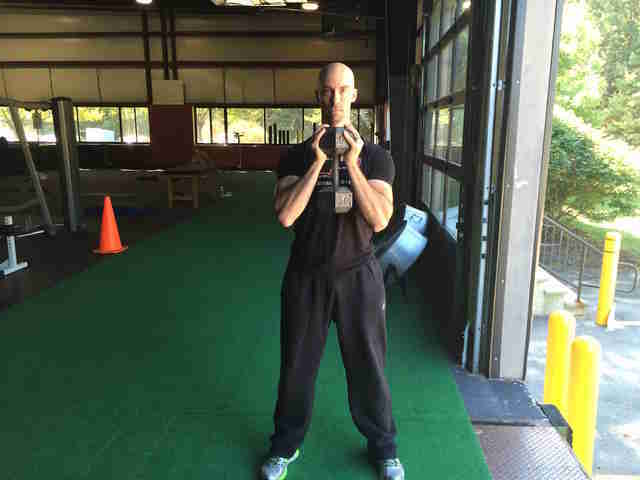 Tony Gentilcore is a Boston-based strength and conditioning coach and one of the co-founders of Cressey Sports Performance. For more information you can check out his website as well as share his affinity for Star Wars (and cheese) on Twitter.